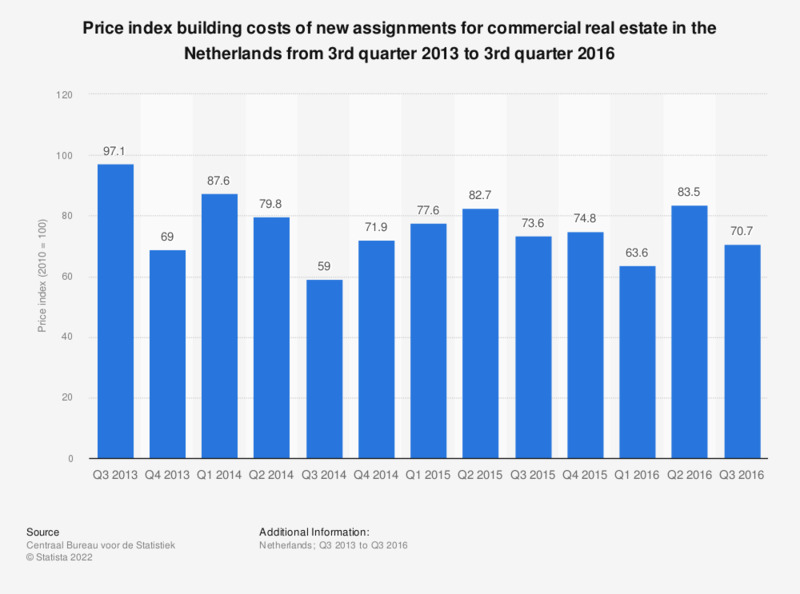 This statistic shows the price index building costs of new assignments in the Netherlands for commercial real estate from the third quarter of 2013 to the third quarter of 2016. In the third quarter of 2013, the index for building costs was 70.7 in the Netherlands. In recent years, the commercial real estate market in the Netherlands shows signs of recovery from the financial crisis. In the fourth quarter of 2016, the total number of commercial buildings constructed in the Netherlands reached a value of approximately 2,087 units. Demand of office space, for example, is increasing whilst a decrease is visible for the supply of offices. Between 2012 and 2017, the total take-up of office space in the Netherlands increased from approximately one million square meters to approximately 1.3 million square meters. In 2017, real estate prices are expected to increase as a high number of sales, combined with an increasingly scarce supply, are expected to push prices further up. The source states that the real estate assignments used in these numbers "have such agreements that the design or construction can start immediately." Also, the assignments have a minimum value of 200,000 euros. Both new constructions as well as reconstruction are included.